Just after the announcement of graduation final year results, University has invited the online applications to take admission in LNMU PG First Semester Online wiThout any delay. If you are the one who recently completed your Graduation (B.A, B.Com, B.Sc etc.) and want to go further for Post Graduation can apply now. Before going towards the online apply and other details, let me give you some extra details about this PG Admission system of Lalit Narayan Mithila University, Darbhanga. Every year, After announcement of LNMU Final Year Results of Part 3 , University invites applications from the students who are interest in getting their admission in PG Programme. Admisison is not taken directly, it's an entrance based exam. students fill their application form for Entrance exam with a fixed application fee. Only those students who will pass this entrace exam will get their admission. In a notification releaesd by LNMU Darbhnaga, applications for the PG Sememster 1 Entrance Test are invited. also, a list of colleges with the number of seats per subject is shared by them. Admission will be taken on the basis of Entrance Test and only passed applicants will be eligible to get their admissions. Online applications for the Entrance examination is started from 09 October 2017 and last date of applying online will be 25 October 2017. In the official notification released by LNMU Darbhanga, they have also mentioned the probable dates of availability of Admit Cards, Exam and Results date. If you are facing issues in filling your online application form, Dont worry! Step by step guide to fill the online appplication is shared in the below section. Simply follow them and apply for LNMU PG Entrance. 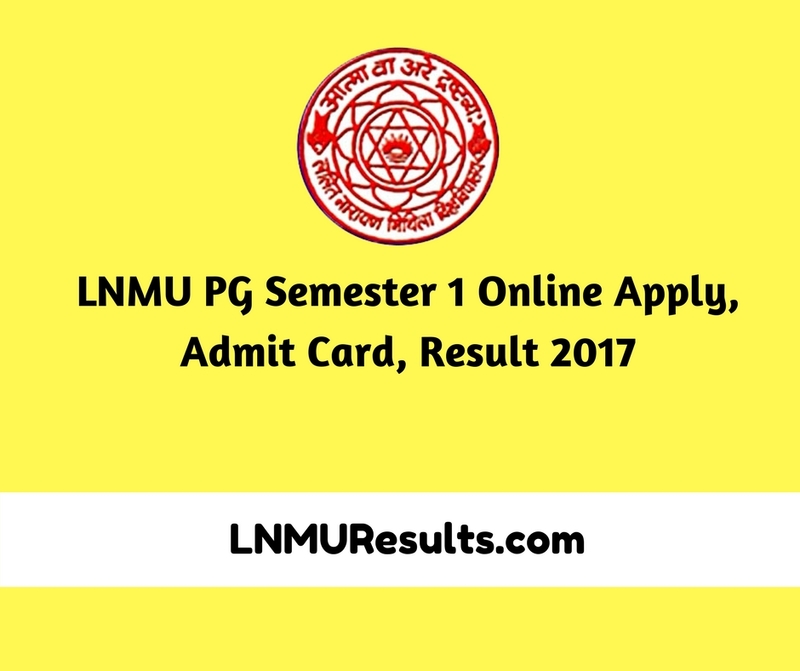 Here I will give you the detailed information about LNMU PG Exam Date 2017 as well as other important dates. In this section, I will show you the full steps to fill the online application. You need your photo, signature and other documents to get your application filled. Kindly follow the below steps and follow them to fill your online application. On that page, you will see a Create Account, click on that. Now a pop-up tab will appear with lots of fields like Username, Name, Password, etc.. Fill them and a unique ID & Password will be generated and shown on the screen. 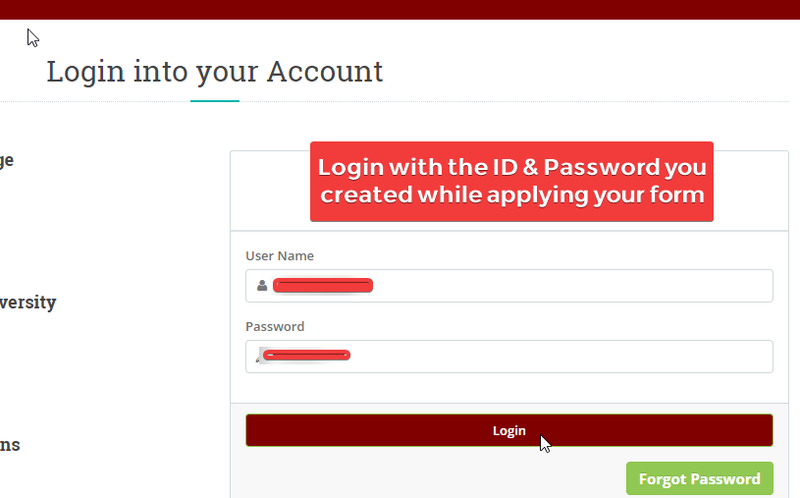 Now, Login using that ID Password and Fill your online application carefully. After that make your payment and download your receipt. Keep it safely for future refernces. As soon as the Admit Cards will be released, this section will be updated with the required upates and links. Update - Admit card is now available to download. Login with your ID Password and you will get a "Print Admit Card" option there. Clickon it and Admit Card will be downloaded. Here are the steps you need to follow to get your PG Entrance Admit Card. Just follow the below steps carefull and you will get your admit card for sure. ID and password is required to download your hall ticket. If you don't know, click on forget paswword option. First of all, Click Here and go the official web portal of LNMU. Now, Enter your ID and password of LNMU Entrance online apply. See the below screenshot for reference. 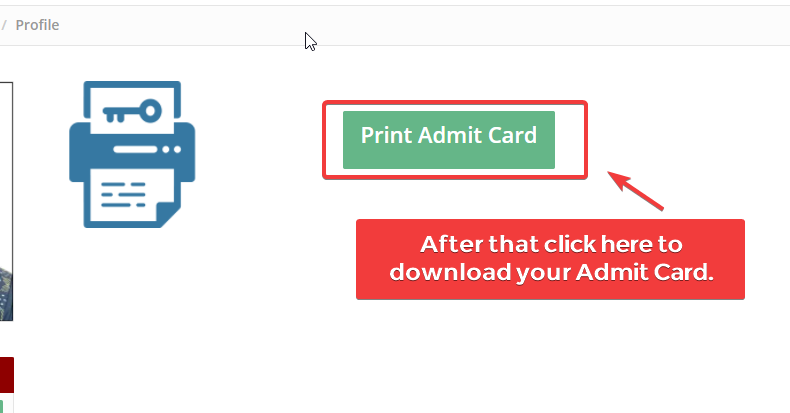 Now, on the next page you will get a Print Admit Card button and by clicking on it you will be able to download amnd print your admit card. See the below screenshot for clear reference. Time to time this section will be updated with the latest announcements made by LNMU regarding the PG Admissions 2017 and all the other updates related to it. Right now, Apply online link is not available and it will be upated as soon as it becomes available on the official site of LNMU Darbhanga. Update : 10 October, 2017 - Apply online link is now available. Those who are interested in getting their admission in LNMU PG Semester 1 can apply now. Link is given in the table above. Exam is scheduled to be conducted on 4th November 2017 and the probable date of publishing of results is 13th November 2017. Looking for the LNMU PG semester 1 entrance results? don't worry I will update that whenever it will be available on the official website of Lalit Narayan Mithila university. According to the official notification the publishing of results of 13th November 2017 but looks like there is a delay in results. So, as usual please wait and I will update this section with all the required details and references whenever the results will be available. After the examination, this section will be updated with the latest announcements and updates by the Lalit Narayan Mithila University, Darbhanga. So, that's all under this topic and I hope I am able to clear all your doubts related to this LNMU PG Semester 1 Admission and in the case of any queries, feel free to drop a comment below. Admit card is now available to download, Login and download your admit card.